This is actually the second recipe I cooked from Revolutionary Chinese Cookbook, but I am presenting it first because so far, it is my favorite. 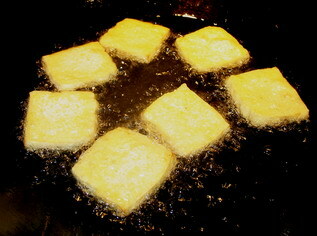 It is a simple dish, though it does require the extra step of deep-frying the tofu. However, the results are so very worth the extra time, trouble and mess that I suggest that everyone ignore their instincts to skip it and pan fry the tofu instead, jump headlong in, use the oil and to heck with it. Even with the extra step of deep frying, the recipe isn’t that difficult, and only a little more messy than it would be otherwise. Secondly–I must suggest a few alternatives for vegetarians and Muslims here, as the recipe is typical of country Chinese cooking wherein a small amount of pork is added to a tofu dish to add flavor and a contrast in texture. Dunlop suggests that vegetarians simply omit the pork and use vegetable broth; I think that instead of doing that, vegetarians would be better off replacing the pork with dried rehydrated Chinese black mushrooms (shiitake) and using the soaking liquid in place of the chicken stock. The mushrooms would add richness and their slippery, unctuous mouthfeel would contrast beautifully with the chewy, craggy deep fried tofu. Muslims can go with the vegetarian option, or they could substitute some top round beef for the pork. Or lamb flank steak would work equally well, and give a more distinctive flavor to the dish than the beef would. 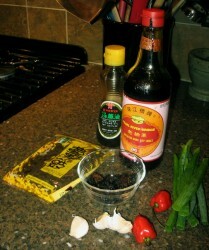 The main flavoring of this recipe, as one can guess from the photograph above are chiles and fermented black beans. I was amazed at the amount of black beans used in this dish, not because I didn’t think it would taste good, but because I was happy to see evidence that someone in China uses black beans with the same heavy-handed abandon that I do! I learned to use fermented black beans from Cantonese recipes, and I had been feeling somewhat like an infidel for always using more black beans than most Cantonese recipes stipulated, but I simply loved the flavor so much, I just couldn’t help myself. And I had found that I adored how they tasted in combination with chile peppers, both fresh and processed, and would find myself slipping those into classic Cantonese recipes such as Beef with Gai Lan, even though those dishes were never meant to be spicy. Maybe, in looking through the recipes in this book, I realized that I was meant to be cooking Hunan dishes, not Cantonese, all these years! I also want to note that I added two ingredients to the dish that are not original to either of the original recipes by Peng or Dunlop: I added red sweet bell peppers and cilantro. The reason is quite simple; I wasn’t making a second dish of vegetables, so I wanted to throw in a bit more of a vegetable element to this dish to round it out. (In short, I was lazy.) If you want to use them, add one sliced bell pepper with the tofu just before simmering, and throw in a good handful or two of cilantro leaves at the very end, just before giving a final stir. Oh, and one more thing. Who is Peng? He is Peng Chang-kuei, one of the most famous of all Hunanese chefs. He fled mainland China at the end of the civil war and has lived mostly in Taiwan since that time. Peng started making the dish in the 1960’s or 70’s as his own lunch in his restaurant in Taiwan, as a reminder of the peasant tastes of his home province. He never meant to serve such a plain and humble dish in his restaurant, however, when he would eat lunch in the dining room, customers inevitably asked what the chef was having, then requested that they, too, have the same dish. It ended up being one of the most favored dishes among his customers. As for Peng–he is also the originator of another very famous Hunanese dish. But, you should read that story yourself in the book. For now have a taste of his home style bean curd. Toss the sliced pork with the wine and cornstarch, and allow to marinate while you are preparing the tofu. Cut the tofu into squares about 1/2 inch thick. Heat the peanut oil in your wok until it reaches about 350-400 degrees F. (To test it, you can stick a bamboo chopstick into the oil. If tiny bubbles form at the end of the chopstick and dance up to the surface immediately, it is hot enough to start frying the tofu.) When the oil is hot enough, carefully slide 1/3 of the tofu slices down the side of the wok into the oil; this keeps the oil from splashing up and hitting your skin. The raw tofu will sink to the bottom. As it cooks, it will begin to slowly ascend to the top of the oil where it will bob and float, slowly turning pale gold with a bubbly, crusty exterior. 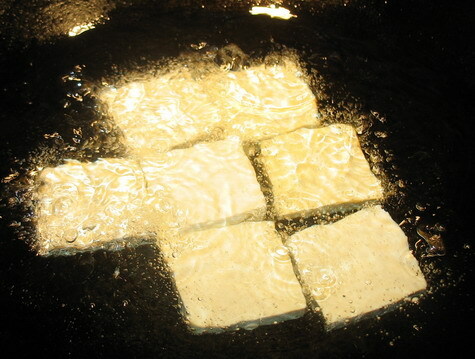 When the tofu is uniformly pale golden, remove from the oil with a skimmer and drain on paper towels. Repeat with the other two thirds of the tofu. Do not overcrowd the wok; if you do so, you will end up cooling the oil and this will result in oil-soaked tofu. Pour off the oil, reserving about 3 tablespoons. Clean the wok, reheat it over high heat until it smokes and add the reserved peanut oil. Add the garlic, chiles and black beans and stir fry until very fragrant, about forty seconds to a minute. Add pork, settle it into a single layer and allow to brown on one side undisturbed–about one minute or so. When it is brown on the bottom and turning white at the edges, start stir frying until there is no pink left on the pork. Pour in the stock and the soy sauce, then slip in the fried tofu. Bring to a boil, then reduce heat to low to simmer and braise the bean curd for several minutes to allow the flavors to penetrate its craggy surface. Add cornstarch mixture and stir until the sauce thickens. Stir in the scallion slices and the sesame oil and chile oil if you are using it. Thanks so much for adding a vegetarian substitution option. This looks absolutely delicious – I think I may make this for dinner this week! Good review. Guess I was expecting that since I’ve skimmed through it already. Will eventually buy the book (maybe on a return trip to the states–it is WAY cheaper in the US, even though the book cover here is WAY cooler). I’m really, quite frankly, so unsurprised that many of the recipes come from Hunanese chefs based in Taiwan. Much of the great cooking here comes from chefs who ran away from the CCP in ’49. Dunlop wrote a very good article in Gourmet magazine (I think) about restaurants in Taiwan and their history. I think it was last september’s restaurant issue. Have you read that article? Another suggestion for vegans or muslims would be to use Soyrizo. Although it is a “faux” product and therefore some vegans frown on it (personally I don’t understand the reasoning), it is wonderfully versatile and has the texture and some of the flavors, in my opinion, of ground pork. And I find it in the local Fry’s market. 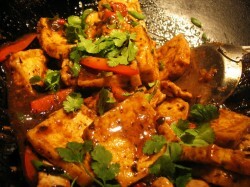 I make a similar dish, with tofu, cilantro, green onions, chili peppers, fermented black beans and cilantro. It also has ginger and garlic in the sauce, which compared to your recipe, may be just a little to much goin’ on…I am going to rework it to be closer to yours. Rose–I would love to see the cover of the Asian version! (How much would shipping to you in Taipei be? If it isn’t too much, I could always send you a copy if you like…. I haven’t seen that article, but I will see if I can track it down online. I am not surprised by the connection to Taiwan, either–so many skilled artists, chefs and the like left mainland China for Taiwan or Hong Kong–or the US–in 1949 that a lot of culture from all of the provinces ended up in Taiwan and HK in particular. Some of it eventually made it to the US, as well. I guess that China’s loss in that area at the time was the rest of the world’s gain…. Charlene–I wouldn’t use Soyrizo–I assume it has a chorizoesque flavor. That would clash with the flavors here. Nor would I use any soy minced meat product as I think that the texture of something sliced rather than minced would be better here. In general, I prefer making substitutions that go with the cultural provenance of the dish. In this case, if I were to use a different protein source for the meat, I would suggest the use of wheat gluten (unless the cook has celiac disease, of course), which was invented by Buddhist monks in China to be used as a meat substitute. It has the chewy texture of meat and a flavor that picks up on the flavors of sauces very easily. In addition, if you mix it with a soy product like tofu, you have complementary proteins–a legume and a grain–which gives the full complement of amino acids. i stopped by our local tofu company (fresh tofu is superior in taste by far) and picked up a couple of pounds. i am wondering if you press the moisture out of the tofu before frying. I didn’t press the moisture from the tofu I used (also locally made and very fresh) because it is quite firm on its own. I just drained it quite well. If your tofu is fairly soft and very wet, you might consider pressing out the moisture before deep frying it. Barbara – Tofu is not on my radar. I really don’t care for the texture. Would this dish work without it? i made this dish last night; it was fabulous. i was a little surprised at how flavorful the beans were. Maureen–you could leave out the tofu, though the texture is much different when it is deep fried. I have had tofu haters like deep fried tofu that had been braised in a strong sauce like this one. 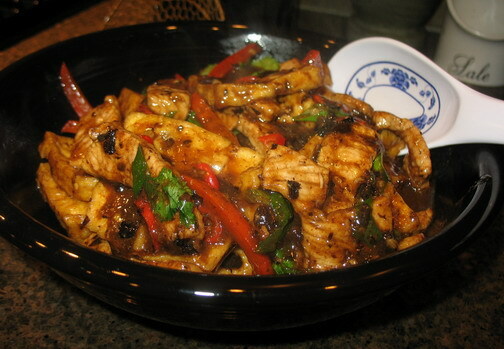 You could always substitute the black mushrooms for the tofu, though and do pork and black mushrooms homestyle! Joe–I am very glad to hear how much you liked it! I haven’t cooked anything with Tofu in such a long time! Thank you so much for this recipe. I made a slightly adapted version of it, and it was incredible. I’ve just been singing your praises on my blog, and I hope you will let me know if I got anything wrong. I can’t tell you how happy I am to have found a recipe that brings back such good memories. Susan, I am thrilled that you enjoyed this recipe so much. I love it, too, and have been making the vegan version this summer because it is too hot to eat meat. I am doubly happy to hear that this recipe brings you good taste memories. Taste and smell bring us so viscerally to a place in the past that they are almost magical. It is always good to find a flavor from the past you thought you had lost. Finding it again is so thrilling, isn’t it? I saw the link to your post from Susan’s site. I often eat this dish at vegetarian Chinese places (the tofu is usually in triangles), and there is often wood ear mushroom and thick slices of bamboo in the versions I’ve had. I’ll definitely try a version of this next week. Will, I hope you try a version with dried shiitake mushrooms–Chinese black mushrooms–in it. It is absolutely delicious. This is also good served with noodles instead of rice, btw. Let me know how you like it, if you would! Thanks for the recipe. It was so simple and so good.